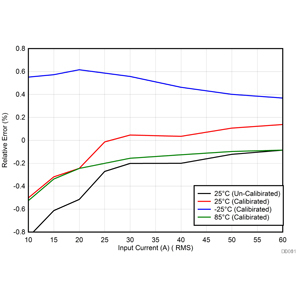 The TIDA-00912 TI Design provides a complete reference solution for isolated current measurement using external shunts, reinforced isolation amplifiers, and isolated power supply. The shunt voltage is limited to 25 mV max. This reduces power dissipation in the shunt to enable a high current measurement range up to 200 A. Shunt voltage is amplified by a instrumentation amplifier configuration with a gain of 10 to match the input range of isolation amplifier for better signal to noise ratio. 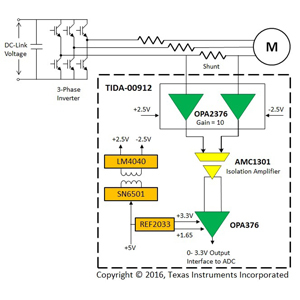 The output of isolation amplifier is level shifted and scaled to fit the complete input range of 3.3-V ADCs. 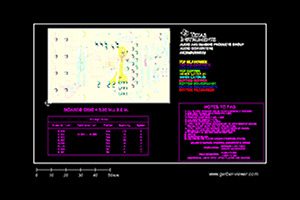 This design uses free running transformer driver operating at 410 kHz for generating isolated supply voltage in a small form factor to power high voltage side of the circuit.